Police forces have on Friday evening cordonned off a village in Upper Egypt’s Minya governorate after a Copt was shot dead in a fight with Muslims, according to the Anadolu Turkish news agency. The victim, Magdy Mounir, was killed during a fight in Deir Pasha village during sectarian tensions which erupted after unknown individuals erased a picture of an imam off a poster titled “Hand in Hand”. The poster was produced by an anti-sectarian NGO displaying an imam and priest locking arms to signify national unity. 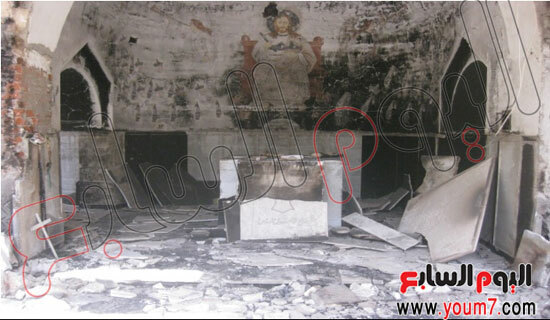 Egypt has been witnessing a rise in sectarian attacks on Copts in recent years. The most recent sectarian attack involved a mob assault on the Saint Mark Cathedral in Cairo’s Abbasiya in April during a funeral for 4 Copts killed in sectarian clashes in Upper Egypt. 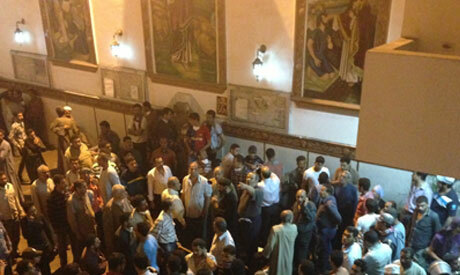 Police also fired teargas at the church complex during the attack, stirring the anger of many Copts. 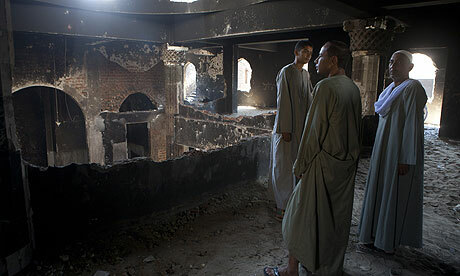 Mohammed Nouhan, El Shorouk Newspaper/ Associated Press ) - Onlookers gather at the house of Egyptian Christian, Samir Iskandar which was burned during clashes between Muslims and Christians in Qalubiya, just outside Cairo, Egypt, Saturday, April 6, 2013. Several Egyptians including 4 Christians and a Muslim were killed in sectarian clashes before dawn on Saturday, security officials said. 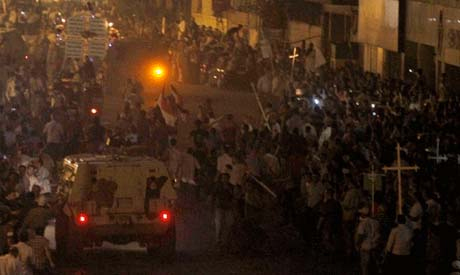 CAIRO — Clashes between Egyptian Muslims and Christians erupted early Saturday in a town near Cairo, leaving at least five people dead, security officials said. Investigators said they were waiting for autopsy reports to confirm how the men — four Christians and a Muslim — were killed in the small town of Khosoos, some 20 kilometers (12 miles) north of the capital. 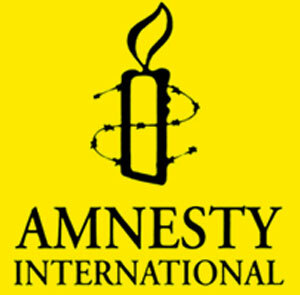 CAIRO (AP) — Amnesty International has called on Egyptian authorities to release a Coptic Christian schoolteacher held for contempt of Islam. 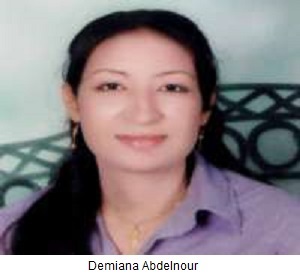 The rights group on Friday denounced the detention of 24-year-old Dimiana Abdel-Nour, a social studies teacher in a southern village near the famed city of Luxor. She was accused by some students of allegedly showing contempt while talking about Islam in class last month. Luxor prosecutor issued an arrest warrant against Abdel-Nour this week over allegations of proselytizing and of “defamation of religion.” A court is scheduled to look into her detention on Saturday. 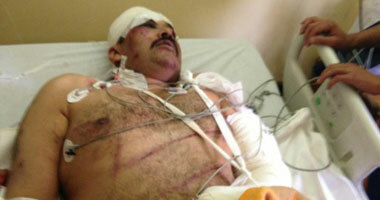 Amir Ayad was snatched and torutured by Muslim Brothers "Arabic"
نقل مينا ثابت، عضو اتحاد شباب ماسبيرو، عن أمير عياد، عضو جبهة الشباب القبطى، الذي اختفى خلال أحداث المقطم أمس الجمعة، أن الأخير تم اقتياده مع مجموعة كبيرة من الشباب من قبل شباب الإخوان المسلمين وتم احتجازهم بأحد المساجد، على حد قوله. Read more: Amir Ayad was snatched and torutured by Muslim Brothers "Arabic"
At least four Coptic activists were arrested on Friday dawn for complicity in St. Mark’s Cathedral clashes which erupted outside the cathedral on Sunday as Coptic families were preparing a funeral procession for those who were killed in Al-Khasous the day before. 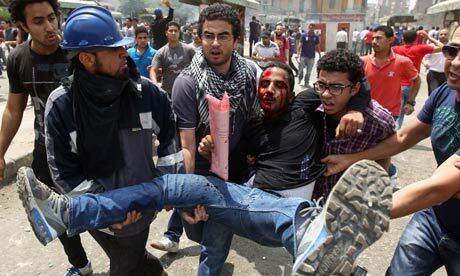 The Coptic Maspero Youth Union announced that Michael Morqos was arrested on Friday alongside three other activists. The union condemned his arrest, calling it an escalation against Coptic youth and likening it to Mubarak’s violations against Copts where “the violator is free and the victim gets jailed and humiliated”. Read more: Limited fire in church in Giza "Arabic"
Rocks, fire bombs, gunfire greet mourners leaving funeral of four slain Christians. 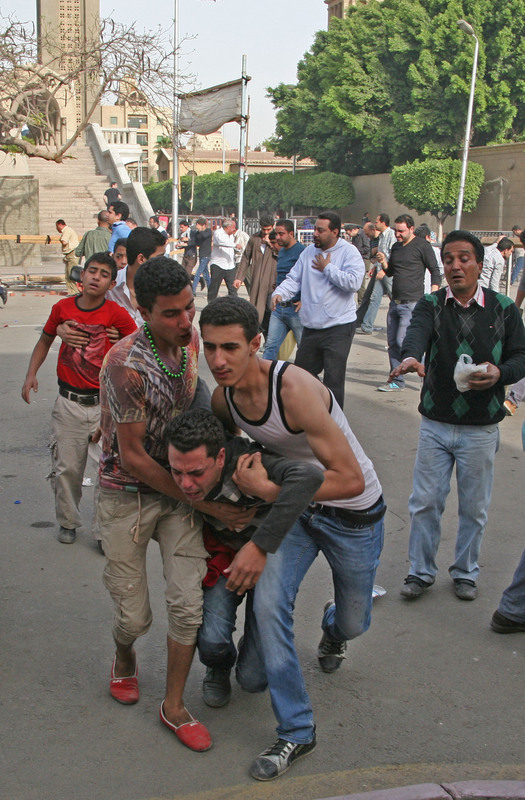 CAIRO, Egypt, April 7, 2013 (Morning Star News) – Coptic Christians attending a funeral service here today for four Copts killed two days earlier in an anti-Christian rampage were in turn attacked themselves by at least 200 Muslim rioters. 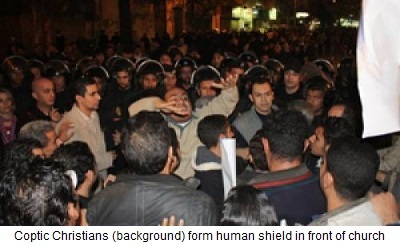 The incident, which started with a few dozen men pelting the mourners with stones, quickly escalated into a massive attack against Christians at St. Mark’s Coptic Orthodox Cathedral in the Abbassia area of Cairo involving firearms, flash-bang grenades, tear gas, fire bombs and other improvised weapons, besides cars set ablaze. A Morning Star News reporter observed that police took more than an hour to respond, and when they arrived, they did nothing to stop the attack. Instead, most stood and watched men throw rocks at the Christians gathered at the gates of the cathedral compound or hurl stones over walls at the Christians trapped inside. (AINA) -- Thousands of Copts attended the funeral service held today at St Mark Cathedral in Cairo for the Coptic victims killed by Muslims on April 4 and 5 in al-Khosous, Qaliubiya (AINA 4-6-2013). The service was attended by Christians from all denominations as well as Muslims. 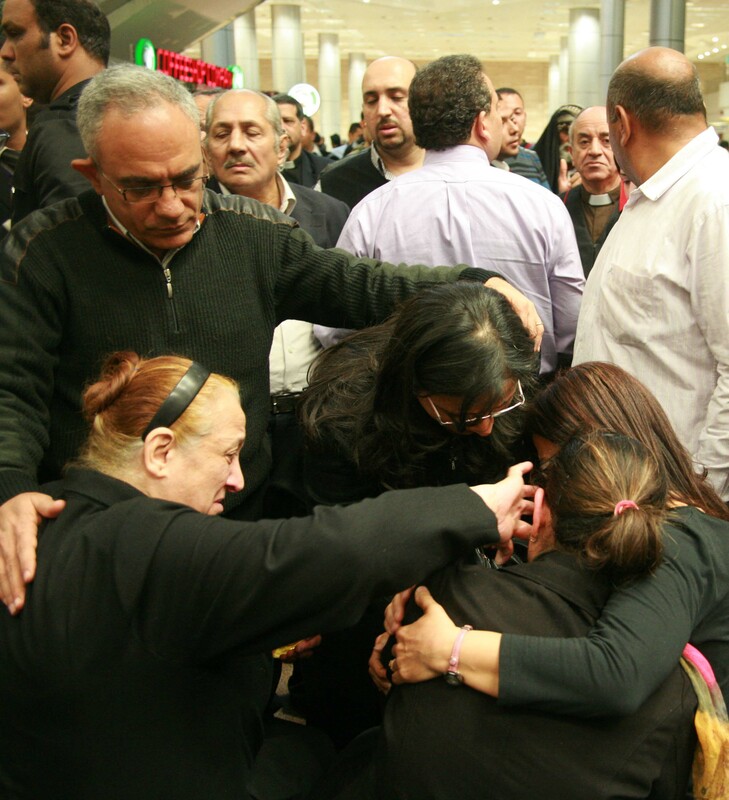 Priests holding the service were unable to calm the Copts and at several times the service was interrupted by the wailing of the mothers of the victims, protests by angry Copts demanding retribution, and chants saying "no to the persecution and killing of Copts." 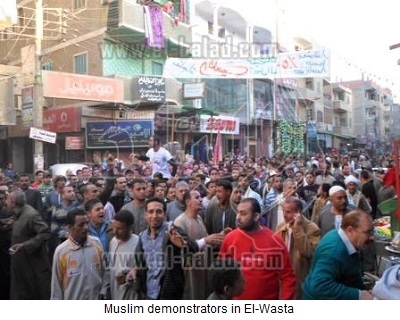 Political chants dominated the scene, demanding President Morsi to "Go Away," and banners holding him responsible for the killing of Copts in al-Khosous were displayed. After the funeral services ended, as coffins and attendants were leaving the cathedral, unidentified persons fired shots in front of the cathedral. It was reported that clashes took place between Copts coming out of the Cathedral and Muslims in the area, and that Muslims were on roof tops of neighboring buildings firing at them (video). Sources Say Beatings, electrical shock exacerbated serious heart condition. 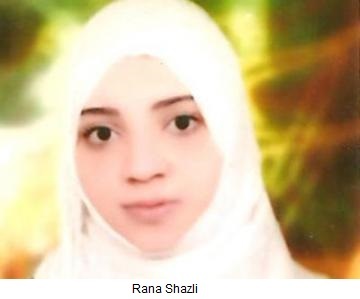 CAIRO, Egypt, March 14, 2013 (Morning Star News) – Repeated electrical shock torture of an Egyptian Christian accused of “proselytizing” in Libya likely exacerbated his heart ailment, leading to his death in custody, according to sources close to the deceased. 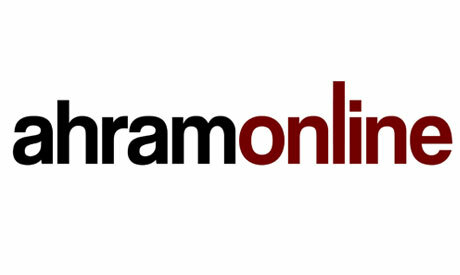 A rumour has spread in the Upper Egyptian city of Kom Ombo that a divorced Muslim woman in her mid-30s was kidnapped by the Coptic Church and converted to Christianity. In an area divided by tribal and religious allegiances, the story has fuelled violence against the area's Christian minority. The city's largest church, the Church of Mar Girgis, has been under attack for the past three days by what residents describe as "unknown assailants." 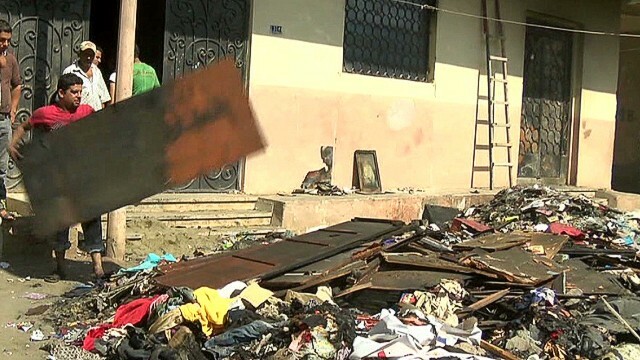 Mostly in their teens, hundreds of young boys and men have been surrounding the church and pelting it with rocks and Molotov cocktails.